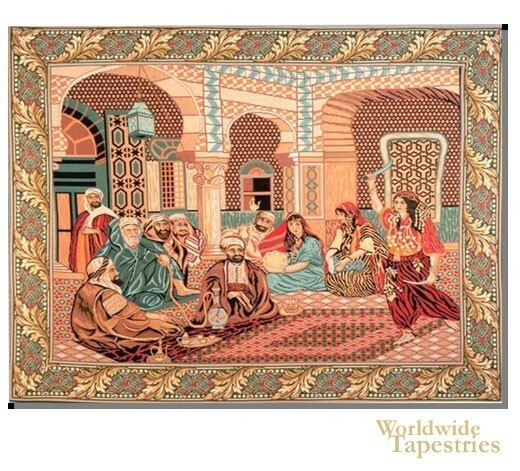 This Musical El-Khalifa tapestry shows an exotic Arabian scene of festivities. We see the members of the palace gathered together, celebrating with dancers, and music. The colors are jovial and bright, and shows textures and patterns showing off the beauty of the room. A floral and foliage border completes the work. This Musical El-Khalifa tapestry is backed with lining and tunnel for easy hanging. Dimensions: W 62" x H 60"